Available from online vendors, so I will not be posting a sample. Presented here to share the cover art which certainly sets the tone for this collection of light, flowing arrangements. Some buyers may have been looking for more drama out of this set, especially for a 1958 release which pitted Riddle against a number of other "exotica-styled" releases. I enjoy the smooth, almost one dimensional sonic quality the project delivers. From the back cover: The California home of arranger-conductor Nelson Riddle is situated on the shoreline of the vast and ever-changing Pacific. 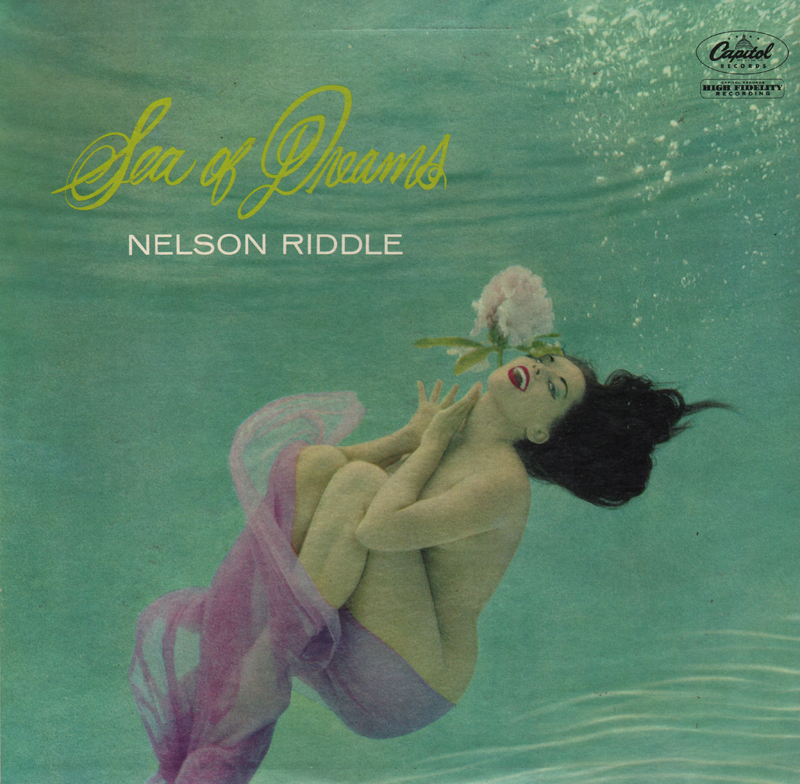 It was in such a setting that he conceived the theme, and wrote the arrangements for this album, "Sea Of Dreams." Actually, there are two themes, the sea and dreams. Delicate fusion of the two results in music that is especially moving and romantic. 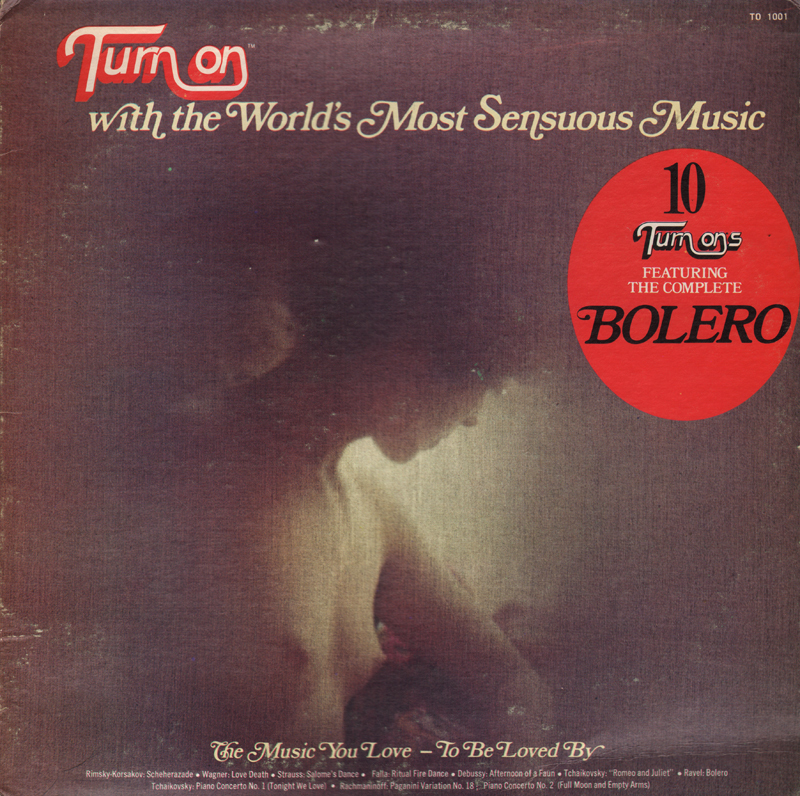 Apparently (from the back cover), Moss released at least 8 of these "Turn On" themed LPs. 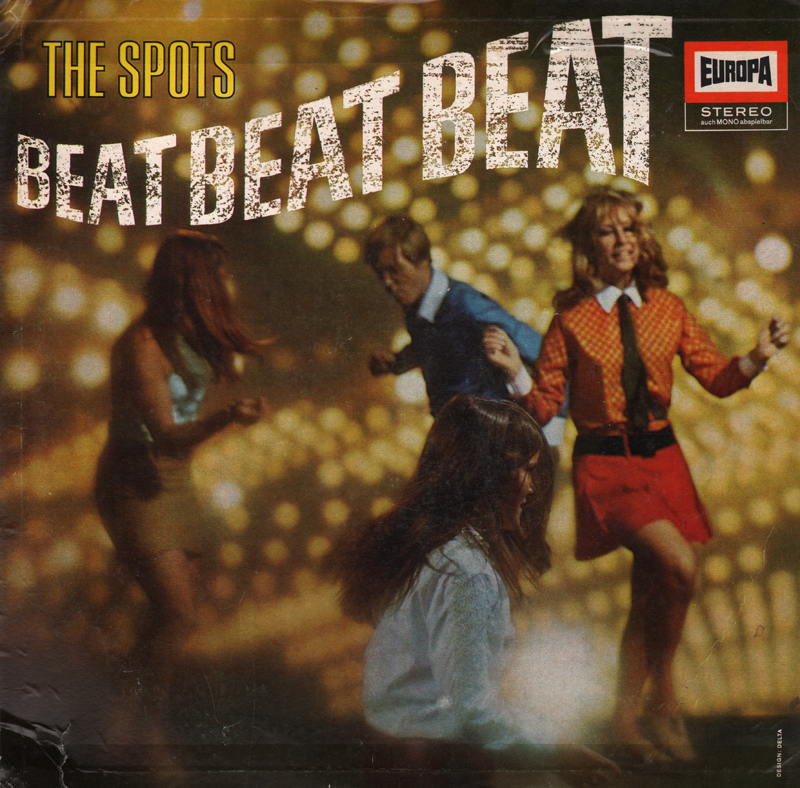 This is the first release in the series. This set features a stock (unknown artist) classical music compilation. 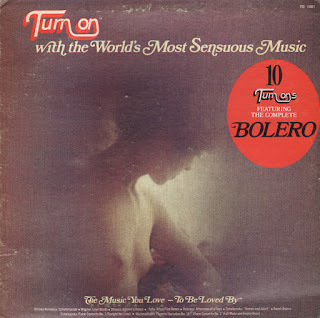 However, the Vox-Turnabout Catalog receives a bold mentioned on the back cover in association with the Bolero track as if there was some business connection at the time between Moss and Vox-Turnabout. Available from online vendors so I will not be posting a sample, however, the jacket art was worth sharing. 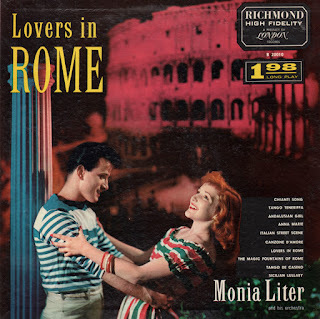 From Billboard - August 5, 1957 (London LL-1687 review): Here are 15 bands of Latin-tinged mood music. Well recorded and attractively interpreted, the music highlights strings and a mandolin is contrasting bright and quiet moods. It's similar to a goodly number of others both in quality and selection; also competition in name value alone is substantial. Play it cool on this. I didn't expect much from this album, but as mood sets go, this is a decent thematic effort along the lines of something you might see produced by Jackie Gleason. This colorful budget reissue features the price printed as part of the design. 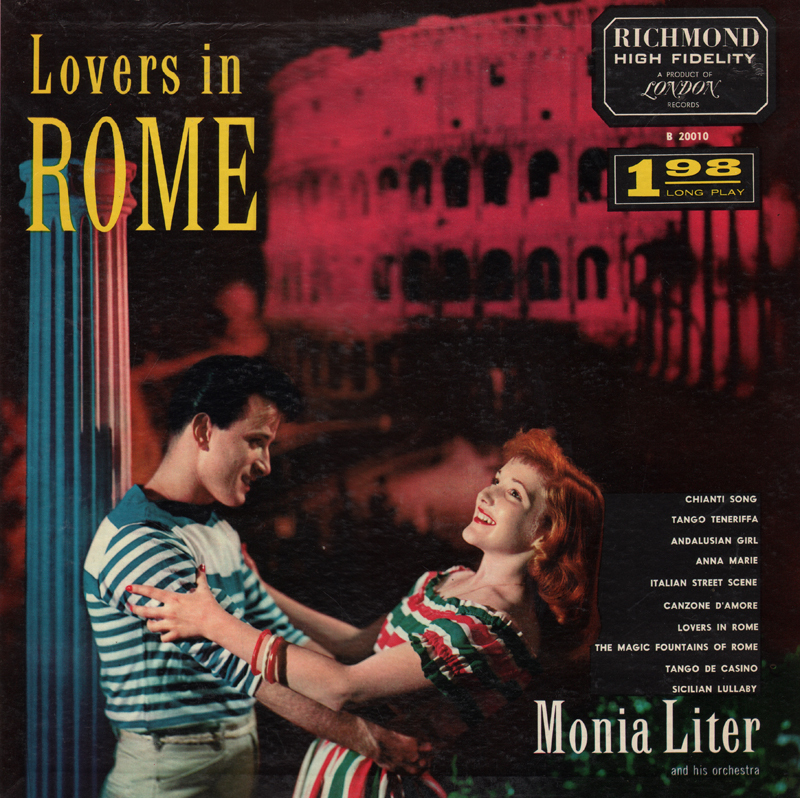 London also released a Liter set titled Lovers In Paris (LL 1643), which apparently preceded this attempt to create a series of Liter "romantic destination theme" packages. Available from a few online vendors, so I will not be posting a sample. 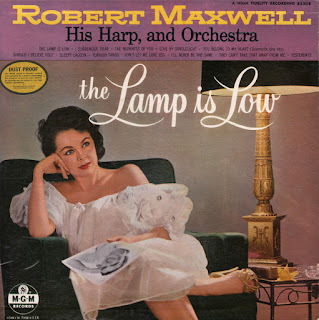 Although I can find no release date for this album, Maxwell's Harp Magic (MGM E3171) is listed on the back cover which was reviewed in a 1955 issue of Billboard. Well executed orchestral mood arrangements that feature, but are not overwhelmed by, Maxwell's harp. 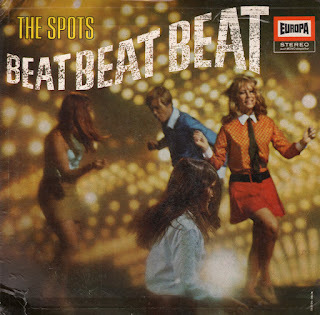 The cover art and title nicely support the tone of the set. From the back cover: The extensive listing of theaters, night clubs, hotels and television shows which have hosted harpist Robert Maxwell gives a hint of his popularity with the American public. Yet, to all intents and purposes this enormous success of a harpist defies the usual convention. But after a few moments of listening to this youthful entertainer performing on his chosen instrument, all doubt as to the reason of his popular following will disappear. First and foremost, Robert Maxwell is an entertainer. The harp is merely his channel to entertaining an audience. A natural showman as well as a highly trained musician, Bob turns his harp into theatrical property. 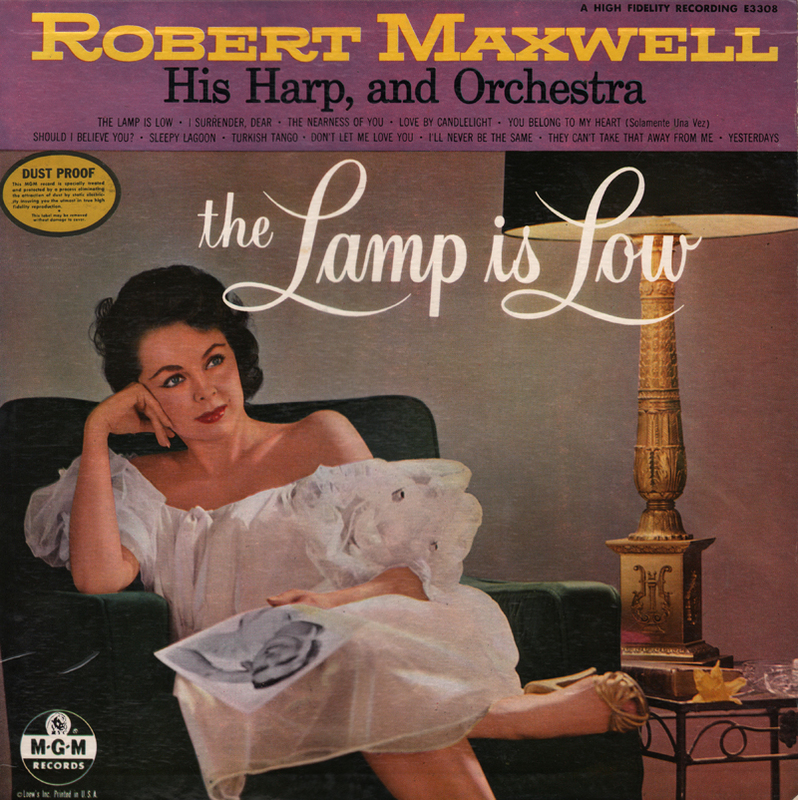 Specially fitted with a system of colored lights which he operates with his feet to dramatic effect, the harp takes on a brilliant new role in the hands of Robert Maxwell. His repertoire is enormous, including classical selections, show tunes, current novelties and "pop" numbers. He can produce mood music – or he can "swing." His ability to use his instrument for comic effect as well as straight performance has endeared him to thousands of his fans. Bob's study of the harp is both unique and comprehensive – but the manner in which he started study is unique. While a student in a New York grammar school, Bob entered a competition with fellow pupils in a musical aptitude test. He won and was awarded a scholarship to Juilliard School Of Music. A choice of instruments was offered him, but he was so smitten at the sight of a harp that he chose it. His various engagements in orchestras in the vicinity of New York led to his becoming a member of the National Symphony Orchestra. He was seventeen at the time, the youngest member of that stellar group. Recitals in New York and Los Angeles and engagements as Arturo Toscanini and Serge Koussevitsky follow. It was not until Bob became a member of the Coast Guard during the war that featured solo work came his way and the chance to show his individuality on the harp. His C.O. in the Coast Guard was Rudy Vallee, who might be said to have given Bob his first real break. 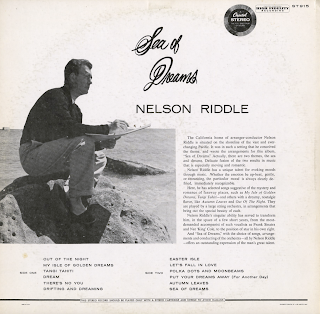 Valley got him the chance to tour the U.S. and the South Pacific as a soloist entertaining servicemen. This gave Bob the experience and composure to go on to becoming a solo performer later in civilian life. He began modestly in radio, passing from there to his present position of fame and demand. He has appeared in motion pictures, on the biggest of TV shows and his recording career has been phenomenal. He is married and the father of two little girls, both of whom he hopes will become harpists.